“Whereas, the colored students of the University of Minnesota, do feel the need of organization and cooperation, and do realize the need of promoting good fellowship among ourselves, and of furthering the interests of ourselves and our race, looking to the Almighty Father for guidance, do organize this club”. With these intentions in mind, the social club Pi Alpha Tau was established. The following men were present: James L. Titus, Gale P. Hilyer, Benjamin F. Bullock, R. C. McCullough, Jasper Gibbs, Jr., Hammond Turner, Raymond W. Cannon, Nelson D. Ricks, Frederick L. Parker, John H. Hickman, Jr., William M. Godette and George Edgar Butler. On May 27, 1911, it was decided to appoint a committee to communicate with the Alpha Phi Alpha Fraternity, the idea of converting the social club into a chapter. The secretary of the social club sent an application for establishment to the fraternity on December 4, 1911. 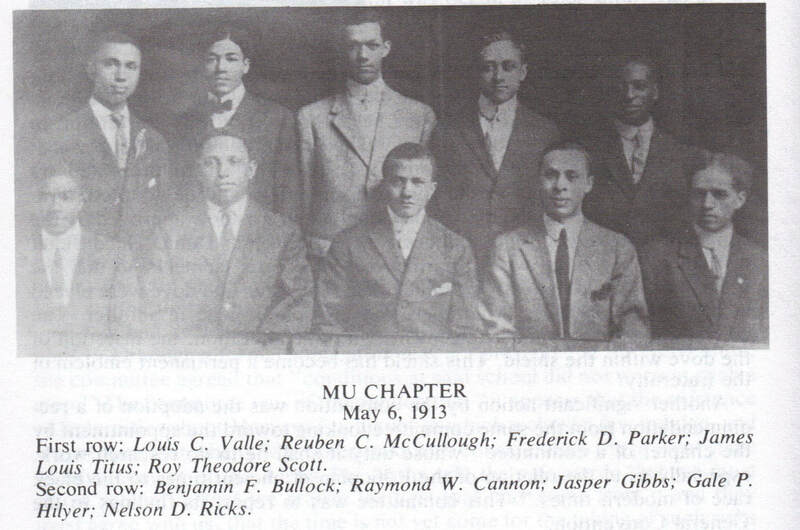 A favorable reply was received and C. C. Middleton of Epsilon Chapter, University of Michigan came to Minneapolis and established Mu on April 12, 1912 and Mu became the 11th Chapter of Alpha Phi Alpha Fraternity, Inc. This chapter soon became one of the leading chapters in the General Organization, and from its membership, several leaders of the fraternity have been chosen. Mu Chapter hosted and celebrated our Centennial on April 12th 2012. Since then Mu Chapter is taking on new initiatives by offering membership through two other college institutions; Augsburg College and Hamline University. Now Mu Chapter is in the beginning stages of becoming a city-wide chapter in Minneapolis and St. Paul and truly embodying the spirit of Alpha in Minnesota.